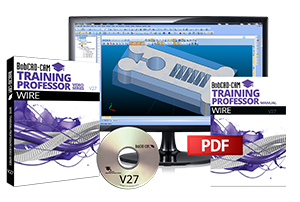 The v27 Wire EDM Training Professor Book & Video Series is a comprehensive training package geared to help you master your 2 or 4 Axis Wire EDM programming software at your own pace. The training lessons cover all of the aspects of the v27 2 & 4 Axis Wire EDM software. Design & editing part geometry from start to finish. G-Code Posting & Simulation for Wire EDM programs! This new BobCAD v27 Wire EDM training series is like having a personal training professor in a box, teaching you everything you need to know about the BobCAD software from A to Z!